When I run the MSP files for the update, nothing appears to happen after it closes out. And the file versions still say 7.2.11719.0. No errors in event log. Did you complete the process by running the SQL script followed by the MPs to be imported/updated? Only then you will see the version number change. I had a similar error. After rebooting all affected Management Servers, and re-executing the script, it was successful. Should note, I have reached out to the MOM (Microsoft Operations Manager) team to indicate an issue with the MSP files and documentation on TechNet — The documentation indicates to run the UR_Datawarehouse.sql file against the Data Warehouse DB, however after running the MSP files, this script is not to be found, only the Update_Rollup_Mom_DB.sql. The Update_Rollup_Mom_DB.sql name would indicate it needs to be run against the OpsMgr DB (as previous UR’s). Either the script name is wrong, or the DW script is missing. However, when running the Update_Rollup_Mom_DB against the DW, it does execute successfully. Try to disconnect your SQL session, and re-connect. Then, re-run the script. Is the script being ran locally, or from a Management Server? If all fails, I would say, wait for Microsoft/MOM team to get back on the documentation errors. I’m local on the SQL server. The error revolves around MPs. Maybe something I haven’t done yet since it’s a new install? I meant, are you copying and saving the script locally on your SQL server, or running it directly from the SCOM server? Also, the errors you have mentioned pertain to SQL, not the MPs. Once you have applied the DW SQL script, then you can proceed with the MPs. The errors from SQL are for MP’s columns in the database is what I mean. 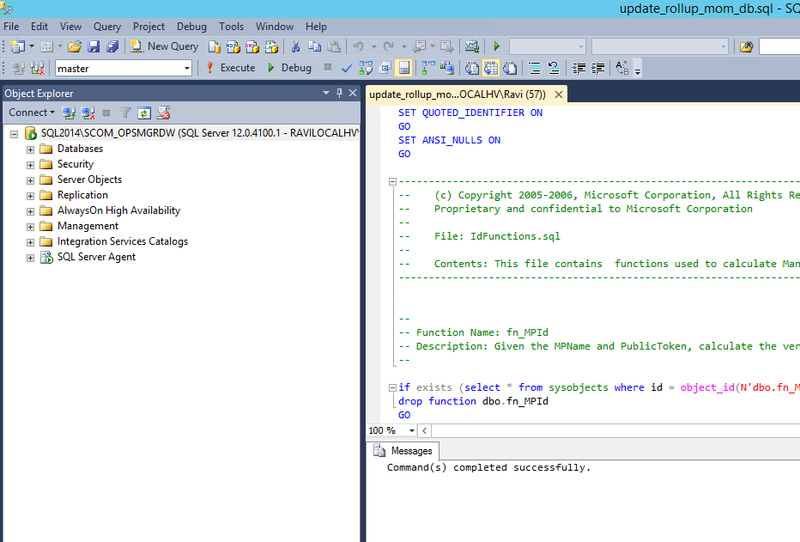 I am running the script within management studio, on the SQL server. Kind of frustrating a fresh install has this issue. One difference I have is two management servers. But I ran the update on both, and rebooted both before trying to run the script. Any other suggestions? Or should I call Microsoft? If you can wait it out for Microsoft to get back to the issues indicated in their KB, then wait. If not, I would call Microsoft. I would be surprised if they have a fix, as the UR was released days ago. Is your environment at least functional for now? Yeah, RTM version is working fine and all agents show healthy. That is good. Give MS a call, see what they say. I would be interested if they have a response/fix to the issue, please share if you can. Also, just to confirm, you do have SQL admin rights on the DB, yes? Yes, not something as simple as that. What version is your console file? 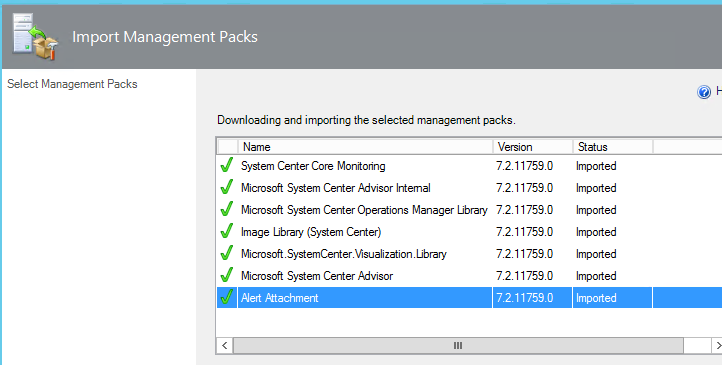 Mine still says 7.2.11719.0, but other files like Microsoft.EnterpriseManagement.Monitoring.Components.dll show the new version. It was a bug with some of the management packs I had added, MS gave me the work around by removing them pre-update through PowerShell, then re-adding them afterwards.. I would not recommend this update and wait for the next one when perhaps they can get their ducks in a row after it’s been out for a while. Look at the list of changed files in the KB Article. None of the executables is updates. HI Mark, thanks for that. This blog post was done right around the time of the release of UR1. There were several issues with the documentation from MSFT. I am positive the documentation was updated after the initial release of UR1 as I personally submitted documentation error issues to the System Center team(s).